Day 274 / Hat 274: White, 100% cotton, baseball-style cap with turquoise-colored embroidery on front that reads: "Citrus." Interior tag reads: Nova, one size fits all, a tradition in headwear for over 60 years, made in China." A loaner from the Russ Parsons BOH, it references Citrus, Michel Richard's long-shuttered L.A. restaurant, which, from 1986 to early 2001 occupied the Melrose Avenue space that's currently home to Hatfield's. This isn't a totally random grab from the grab bag, though. 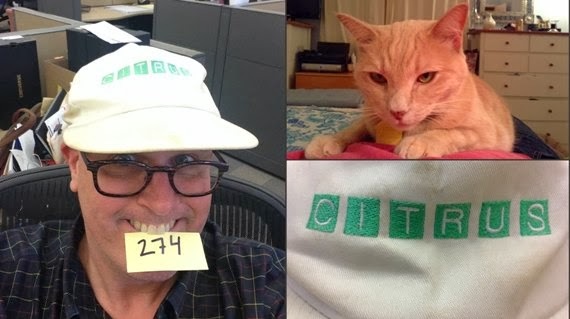 I chose it as today's hat in honor of our cat -- also named Citrus -- who joined the family a year ago this week. (I remember it well -- being Pirate Season and all -- she didn't come out from under the bed for nearly a week). That's her on the upper right above the closeup of the Citrus logo embroidery. That was the name she came with and we decided to keep it -- though in truth she sometimes moves through the house at such a high rate of speed we sometimes refer to her as "Butterscotch Lightning." The Cat in the Hat I am not. But a Cat on a Hat? That I've got. So a kitty hat-tip to the Lady Citrus and bolts of butterscotch lightning -- or butterscotch dust mops as the case may be - wherever we may find them perched and purring.